Full frame protection & powder coated frame. Noise levels as low at 67dB (at 7m). 2.8kW output for demanding tools and equipment. Electric ignition for easy recoil start up. Pictures for illustration purposes only, colour and configuration may vary. Free delivery on all orders to UK Mainland. Ask us a question about this product, please use our contact form. 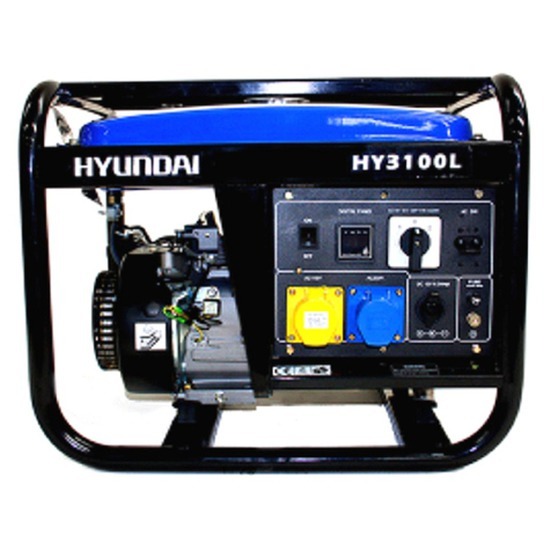 The HY3100L is the solid entry level model that the rest of the Hyundai open frame petrol generator range builds upon. It boasts impressive portability, power and reliability for demanding work wherever consistent power is a must, and is fitted with a reliable AVR unit for a stable power output and smooth supply, which is better suited for sensitive equipment. Built with a large 15L fuel tank for long running to get you through the working day and benefits from low oil shutdown to protect the generator from damage. With a maximum output of 2.8kW, the HY3100L is ideal for supplying off-grid and on-site power for tools and equipment. Weighing just 45kg, this is a portable generator which can be easily transported from one job to the next. This portability makes it the ideal petrol generator for commercial building rade, hire centres, mechanics and tradesmen. Built within a rugged open frame, this petrol generator is protected from knocks and also doubles up as carry handles. All Hyundai petrol generators are covered by a standard 1 year Hyundai warranty. Copyright © 2019 Kentec Generators. All Rights Reserved.